Jackson’s Story is a gentle, insightful story with a valuable lesson for any family considering pet adoption. 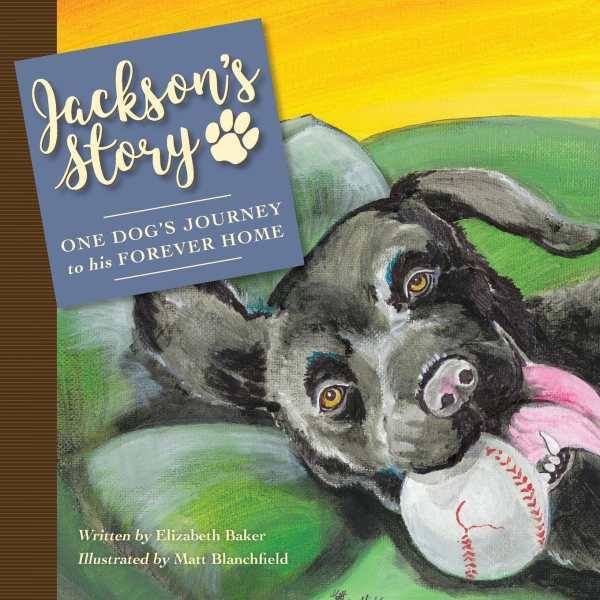 Elizabeth Baker’s Jackson’s Story is a heartwarming picture book in which a frisky pup experiences kindness, then neglect and sudden abandonment, on a journey that ultimately leads to hope, security, and placement in a loving forever home. Toby loves his newly adopted dog, Buddy. But when the novelty wears off, he begins to neglect his furry friend. Toby’s irritated dad eventually takes Buddy for a ride and leaves him tied to a tree in the woods. Discovered by friendly humans, the newly-named Jackson is initially taken to a shelter, then a rescue clinic, and is finally transported miles away to be adopted by a loving couple. The story is told from the central four-footed character’s point of view. While the narrative begins and ends on a happy note, its developments emphasize the fear and angst of the dog’s mind when he is relegated to unknown surroundings, mistreated, and unconscionably deserted. As a creative design element, Jackson’s excitement and concerns, both good and bad, are often emphasized with the use of fully capitalized words. While the primary narrative revolves around Jackson’s commentary and reactions to events, actual dialogue is limited to brief interactions with the people whom the traveling adoptee meets along his rescue route. The work includes much more text than a typical picture book. It seems better suited to an advanced young reader with an established vocabulary. However, the story’s premise would certainly work for a shared parent-child experience, providing a sincere teaching moment. While sentences tend to be lengthy, their informative purpose moves the story forward. Realistic, colorful illustrations appropriately texture each part of Jackson’s journey. The confused pup’s soulful eyes tug at heartstrings. As a continuing educational tool, the book’s afterword explains that Jackson’s experience is one shared by many abandoned pets. Young readers are urged to help by showing their animals kindness, having them neutered, and contacting a rescue group if any relinquishing is necessary.